I knew when we bought our quarter of a cow that we might run out of freezer space as a result, and the inevitable has finally happened. 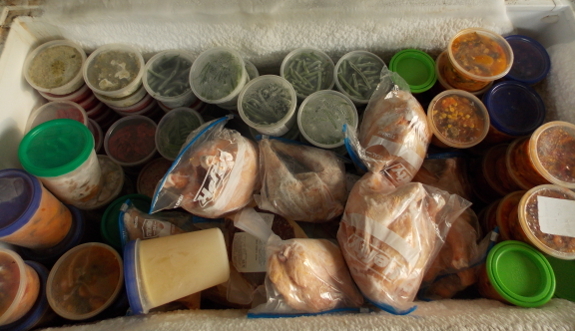 Pastured beef, homegrown chicken, some strawberry jam and leather, plus 22 gallons of various vegetables equates to a freezer nearly full to the brim. What's next? If it were September instead of August, I'd say, "Time to rest on my laurels and prepare for winter!" But the garden is still overflowing, and we should have at least a bushel apiece left of beans, corn, and tomatoes coming in over the next few weeks. In a pinch, I can give some away, but we always wish we had more summer bounty come spring, so I'd prefer to preserve at least a few more gallons of warm-weather food. The obvious solutions to round out our preservation campaign are canning and drying. If I limit myself to plain tomatoes, canning is easiest since I can use the hot-water-bath method, but I'm tempted to brush off the pressure canner we bought years ago as a backup to the freezer and try my hand at canning soup. Alternatively, I could dry tomatoes, which is a bit more nitpicky but is cooler since the heat source is outside rather than right in our living area. And, if I were brave, maybe I'd even try my hand at drying corn and beans? It's a mixed blessing having the freezer already full. When I run out of freezer space, I pull out the pressure canner. I'm slowly getting used to it. It's my favorite way to can beans. I just read this post on canning red beans: http://hickeryhollerfarm.blogspot.com/2014/08/canning-red-beans.html Her blog is full of this kind of information and she makes it sound easy. I'm going to try doing beans that way. I'm thinking once you start up the pressure canner for your soup, there won't be any stopping you. It sure freezes up a lot of freezer space. Of course you would have to break some rules and find some "older" information to get a timetable that will tell you it's safe to pressure can tomatoes. I like it because I can use less water, and it takes so much less time than water bath canning. Although I have water bath canned in short water years and used that hot water to wash dishes or anything else that needed hot water. When I left Philly back in 1998, my ex boss was kind enough to buy me a pressure canner and I thank him every time I can veggies. I wouldn't be without my canner! Right now I've got an overflow of tomatoes, but that's okay because it will last me about 2-3 years. I've canned corn, beets, beans, apples, pumpkin, and I can't even remember all the other stuff I've canned over the last 15 years. Drying: spinach, onions, sorrel, herbs (of course) and a whole slew of other veggies can be dried. I highly recommend the book Stocking Up for understanding how the can, freeze, dry, etc. produce and meats even. My neighbor to the south of me had pigs last year and they suddenly disappeared one day. I asked her where her pigs were and she answered, "Oh. They're in the freezer!" I just canned some tomatoes this weekend and was surprised that it is now recommended to process them for 85 min. I wish I had a pressure canner, and might just move to one next year. With a pressure canner you could can your meat too and save space in the freezer. I might think about a second freezer. For me canning is a great deal more work than dehydrating. I am moving to canning just a few things. Tomatoes, as their liquid is often the base for much of what I cook and adds that flavor needed. A few types of relish and pre-made pizza or spaghetti sauce. The rest I dehydrate as it saves space, I have wood heat so simmering something to reconstitute is not an energy loss as it otherwise might be if I had to turn on the stovetop for just that for part of the day. I almost never put fruit or veggies in the freezer except as a temporary storage for leftovers. The freezer is almost exclusively for beef, pig, lamb. My favorite dehydrating books are Trail Food; drying and cooking food for backpackers and paddlers. This is small but covers more of a how-to than anything else and is excellent for those who are familiar with their own recipes, spices and preferences. Making & Using Dried Foods is the next step up with every piece of how to dry it with one or two basic recipes to go with each type of food. Probably the best reference for dehydrating but the recipes are somewhat bland or older. I will say the mustard cabbage stir is surprisingly good and a new on to us. The last is the Dehydrator Bible which has your fancy recipes and is excellent for fruits and desserts as well as some pretty good replicas of other types of meals your family might be familiar with if you are used to boxed foods. This is my "expand your dehydrated meal" repertoire book. She also splits out a 'backpacking' section which is good but something to practice at home first. I find the first book more useful in that area because that author has practised what he preaches and practised some more and so his thinking is very much around what works on the trail. A very good primer if you ask me and even though it is a thin little book it keeps giving up gems to use. Whereas the Dehydrator Bible is my go-to when I have guests and need something a bit more fancy from my stores of dehydrated veggies. The one key I got from all of these books is that there is value in dehydrating foods in different shapes. Both shredded and sliced carrots are very useful but in different forms. The first in cakes/bread and the second in soups. etc. etc. I'm still in the learning curve for dehydrating but as space is an issue for me I'm trying to get farther in this area. I canned for many years before and always ran out of food long before harvest season the next year. I can see the value of canning and please do not take my long-windedness on the subject of dehydrating as disliking canning, both have great value in getting us to the next year's harvest, I'm up against issues specific to where I live. Why not get another freezer? It's not uncommon up here to have multiple freezers. I have three; a freezer for salmon and halibut, a freezer for moose and caribou and a freezer for everything else. Stored outside, we can unplug them during the winter and save on energy - of course, our winters stay in the sub-zero range for the most part. I'm a big fan of water bath canning, dehydrating, and pickling. I'm learning lacto-fermentation and I hope to learn pressure canning next year. Of the stuff I want to put up, I'm trying to get as much out of the freezer as I can, so it's less dependent on electricity to stay edible. I like dehydrating as much as possible. Recently someone mentioned to me dehydrating green beans which their parents called leather britches and they thought the taste was fuller than that with canned beans. It is on my list to experiment with. Pizza sauce cans exceptionally well, and you've described your love of home made pizza in posts before. I usually do the equivalent of a quart mason jar of whole tomatoes (remove the seeds as best you can, they can make the sauce bitter if they get smooshed up) and a 12oz can of tomato paste to thicken it, which may not be needed if your tomatoes have a low enough water content. Add about a shot glass of dry red wine, a couple of generous sprigs of fresh rosemary, about 2 tablespoons of fresh rosemary, 2 cloves of garlic, and salt, pepper, and cayenne to taste. Sometimes I'll even give it a little shot of Louisiana hot sauce to add some zip. Spin it all until smooth in the food processor or blender, then can as usual. One quart mason jar ought to make at least 5 pizzas, but probably much more than that. The only big issue is that you'll need to freeze the leftovers, or reseal the can, once you open it to get some out, so I recommend canning in quart jars to minimize waste. I also like taking one meaty short rib, putting it in a quart jar with garlic, ginger, a squirt of soy sauce, and water to cover, and canning. It makes a lovely garlic-ginger-beef broth right in the jar! I've also always thought it curious that you freeze soup. Here, we do the ingredients separately (can the tomatoes, freeze the other things) and quick-assemble when needed. Keeping the water out of the freezer saves a ton of space. Which my bestie and I had quite the laugh over, lots of jokes in there about tusks, etc. Please think of this as entertainment, not advocating anything. Keep an eye out for one of the outside propane turkey fryer kits. I use the burner from one on the back porch to do my pressure canning.